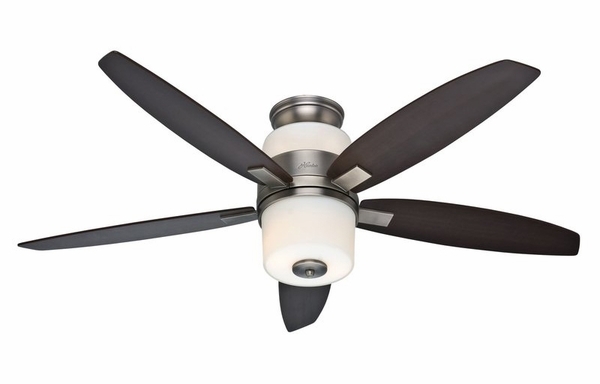 Hunter 59010 Domino Ceiling Fan with Blades and Light Kit - 52"
Home > Home Improvement > Fans > All Ceiling Fans > Hunter 59010 Domino Ceiling Fan with Blades and Light Kit - 52"
For a new and unique twist on modern, contemporary design, check out Hunter's Domino Ceiling Fan. This 52 inch fan from the Hunter Fan Company features a gorgeous antique pewter finish paired with five dark maple fan blades that reverse to a rosewood finish. The Domino Ceiling Fan is a true stunner and a work of art. It will surely become the focal point of your home! The Domino Fan has three different fan speeds: high, medium, and low, for the perfect amount of air movement. The light fixture, which is included, uses four 40W candelabra bulbs, which are also included.